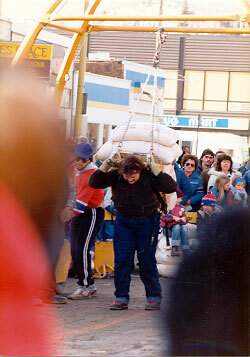 This is the Whitehorse Rendezvous Flower-Packing Contest where people compete to see how much weight, in bags of flower, they can carry a given distance. This lady (yes lady) is carrying over 300 pounds! Now that's a good Yukon Woman! The weird contraption attached to the flour bags is for safety reasons, tracking along with the carry in case a competitor collapses under the heavy load.